Central banks provide reserves to the commercial banking system usually at some penalty rate. However, this compromises their capacity to target a given monetary policy rate. The facts are as follows. First, central banks will always provide enough reserve balances to the commercial banks at a price it sets using a combination of overdraft/discounting facilities and open market operations. Second, if the central bank didn’t provide the reserves necessary to match the growth in deposits in the commercial banking system then the payments system could be impaired and there would be significant hikes in the interbank rate of interest and a wedge between it and the policy (target) rate – meaning the central bank’s policy stance becomes compromised. Third, any reserve requirements within this context while legally enforceable (via fines etc) do not constrain the commercial bank credit creation capacity. Central bank reserves (the accounts the commercial banks keep with the central bank) are not used to make loans. They only function to facilitate the payments system (apart from satisfying any reserve requirements that might be in place). Fourth, banks make loans to credit-worthy borrowers and these loans create deposits. If the commercial bank in question is unable to get the reserves necessary to meet the clearing requirements from other sources (other banks etc) then the central bank has to provide them. But the process of gaining the necessary reserves is a separate and subsequent bank operation to that involved in the deposit creation (via the loan). Fifth, if there were too many reserves in the system (relative to the banks’ desired levels to facilitate the payments system and the required reserves then competition in the interbank (overnight) market would drive the interest rate down. This competition would be driven by banks holding surplus reserves (to their requirements) trying to lend them overnight. The opposite would happen if there were too few reserves supplied by the central bank. Then the chase for overnight funds would drive rates up. In both cases the central bank would lose control of its current policy rate as the divergence between it and the interbank rate widened. This divergence can snake between the rate that the central bank pays on excess reserves (this rate varies between countries and overtime but before the crisis was zero in Japan and the US) and the penalty rate that the central bank seeks for providing the commercial banks access to the overdraft/discount facility. So the aim of the central bank is to issue just as many reserves that are required for the law and to meet the banks’ own desires. Now the question seeks to link the penalty rate that the central bank charges for providing reserves to the banks and the central bank’s target rate. The wider the spread between these rates the more difficult does it become for the central bank to ensure the quantity of reserves is appropriate for maintaining its target (policy) rate. Where this spread is narrow, central banks “hit” their target rate each day more precisely than when the spread is wider. So if the central bank really wanted to put the screws on commercial bank lending via increasing the penalty rate, it would have to be prepared to lift its target rate in close correspondence. In other words, its monetary policy stance becomes beholden to the discount window settings. The best answer was True because the central bank cannot operate with wide divergences between the penalty rate and the target rate and it is likely that the former would have to rise significantly to choke private bank credit creation. If the real interest rate (difference between nominal interest rate and inflation) is constant, then a currency-isuing government, which matches its net spending $-for-$ with debt issuance, could double its budget deficit without pushing up the public debt ratio. Again, this question requires a careful reading and a careful association of concepts to make sure they are commensurate. There are two concepts that are central to the question: (a) a rising budget deficit – which is a flow and not scaled by GDP in this case; and (b) a rising public debt ratio which by construction (as a ratio) is scaled by GDP. So the two concepts are not commensurate although they are related in some way. A rising budget deficit does not necessary lead to a rising public debt ratio. You might like to refresh your understanding of these concepts by reading this blog – Saturday Quiz – March 6, 2010 – answers and discussion. While the mainstream macroeconomics thinks that a sovereign government is revenue-constrained and is subject to the government budget constraint, Modern Monetary Theory (MMT) places no particular importance in the public debt to GDP ratio for a sovereign government, given that insolvency is not an issue. Remember, this is merely an accounting statement. In a stock-flow consistent macroeconomics, this statement will always hold. That is, it has to be true if all the transactions between the government and non-government sector have been corrected added and subtracted. So from the perspective of MMT, the previous equation is just an ex post accounting identity that has to be true by definition and has not real economic importance. That interpretation is inapplicable (and wrong) when applied to a sovereign government that issues its own currency. So the change in the debt ratio is the sum of two terms on the right-hand side: (a) the difference between the real interest rate (r) and the GDP growth rate (g) times the initial debt ratio; and (b) the ratio of the primary deficit (G-T) to GDP. A primary budget balance is the difference between government spending (excluding interest rate servicing) and taxation revenue. A growing economy can absorb more debt and keep the debt ratio constant or falling. From the formula above, if the primary budget balance is zero, public debt increases at a rate r but the public debt ratio increases at r – g.
So if r = 0, and g = 2, the primary deficit ratio could equal 2 per cent (of GDP) and the public debt ratio would be unchanged. Doubling the primary deficit to 4 per cent would require g to rise to 4 for the public debt ratio to remain unchanged. That is entirely possible. So a nation running a primary deficit can obviously reduce its public debt ratio over time or hold them constant if growth is stimulated. Further, you can see that even with a rising primary deficit, if output growth (g) is sufficiently greater than the real interest rate (r) then the debt ratio can fall from its value last period. Furthermore, depending on contributions from the external sector, a nation running a deficit will more likely create the conditions for a reduction in the public debt ratio than a nation that introduces an austerity plan aimed at running primary surpluses. Clearly, the real growth rate has limits and that would limit the ability of a government (that voluntarily issues debt) to hold the debt ratio constant while expanding its budget deficit as a proportion of GDP. The wage share in national income in many nations has fallen significantly over the neo-liberal period which signals that the real standard of living for workers has been falling. The wage share in nominal GDP is expressed as the total wage bill as a percentage of nominal GDP. Economists differentiate between nominal GDP ($GDP), which is total output produced at market prices and real GDP (GDP), which is the actual physical equivalent of the nominal GDP. We will come back to that distinction soon. The real wage (w) tells us what volume of real goods and services the nominal wage (W) will be able to command and is obviously influenced by the level of W and the price level. For a given W, the lower is P the greater the purchasing power of the nominal wage and so the higher is the real wage (w). So the proposition in the question – that a declining wage share does not mean the real standard of living for workers is falling – true. Irrespective of what happens to the wage share, as long as the real wage is rising, material standards of living will be rising (other things equal). That is, a declining wage share per se doesn’t denote a decline in workers’ living standards. What it tells us is that a rising proportion of national income is going to profits (non-wages). But that rising proportion could be in relation to an overall expanding pie. A declining wage share is consistent with growth in the real wage which is slower than the growth in labour productivity. If the real wage is growing but labour productivity is growing faster, then the wage share will fall. A declining wage share driven by a real wage falling (and labour productivity at least not falling by as much) would signify a decline in living standards but that is because the real wage is falling. The Eurozone Troika’s strategy for Greece is that domestic deflation will spark an export boom and provide the capacity for the government to run primary surpluses without compromising real economic growth. Although an export boom is unlikely, given current circumstances, if Greece actually achieved positive net exports then the government could push for a primary budget surplus knowing it will not compromise growth. In that sense, the IMF strategy requires more than positive net exports. Bringing these two perspectives (of the same thing) together generates the sectoral balances. The extent to which this allows the government to run a surplus depends on the private domestic sector’s spending decisions (overall). If the private domestic sector runs a deficit, then the Troika’s strategy will work – inasmuch as the goal is to reduce the budget deficit without compromising growth. Assume, now that the private domestic sector (households and firms) seeks to increase its overall saving and is successful in doing so. With the government contracting (and going into surplus), the only way the private domestic sector could successfully net save is if the injection from the external sector offsett the drain from the domestic sector (public and private). Otherwise, income will decline and both the government and private domestic sector will find it difficult to reduce their net spending positions. Take a balanced budget position, then income will decline unless the private domestic sector’s saving overall is just equal to the external surplus. If the private domestic sector tried to push its position further into surplus then the following story might unfold. So the external position has to be sufficiently strong enough to offset the domestic drains on expenditure. For Greece at present that is clearly not the case and demonstrates why the Troika’s strategy is failing. Assume that inflation is stable, there is excess productive capacity, and the central bank maintains its current interest rate target. If on average the government collects an income tax of 20 cents in the dollar, then total tax revenue will rise by 0.20 times $x if government spending increases (once and for all) by $X dollars and private investment and exports remain unchanged. This question relates to the concept of a spending multiplier and the relationship between spending injections and spending leakages. It is designed to help you think about how the automatic stabilisers linked to tax revenue respond to growth. We have made the question easy by assuming that only government spending changes (exogenously) in period one and then remains unchanged after that – that is, a once and for all increase. In the example we assumed an average tax rate of 20 cents in the dollar is levied (which is equivalent to a proportional tax rate of 0.20). So if $100 of new income is generated, $20 goes to taxation and Yd is $80 (what is left). So taxation (T) is a “leakage” from the expenditure system in the same way as imports are. You were induced to think along those lines. The relevant issue to resolve though is – What is the new income generated? The concept of the spending multiplier tells us that the final change in income will exceed the initial injection (in the question $X dollars). Finally consider saving. Households (consumers) make decisions to spend a proportion of their disposable income. The amount of each dollar they spent at the margin (that is, how much of every extra dollar to they consume) is called the marginal propensity to consume. If that is 0.80 then they spent 80 cents in every dollar of disposable income. For income to remain at the higher level (after the extra $100 is created)in the next period the $36 has to be made up by what economists call “injections” which in these sorts of models comprise the sum of investment (I), government spending (G) and exports (X). The injections are seen as coming from “outside” the output-income generating process (they are called exogenous or autonomous expenditure variables). If you understand all that then the explanation of the multiplier follows logically. Imagine that government spending went up by $100 and the change in real national income is $179. Then the multiplier is the ratio (denoted k) of the Change in Total Income to the Change in government spending. 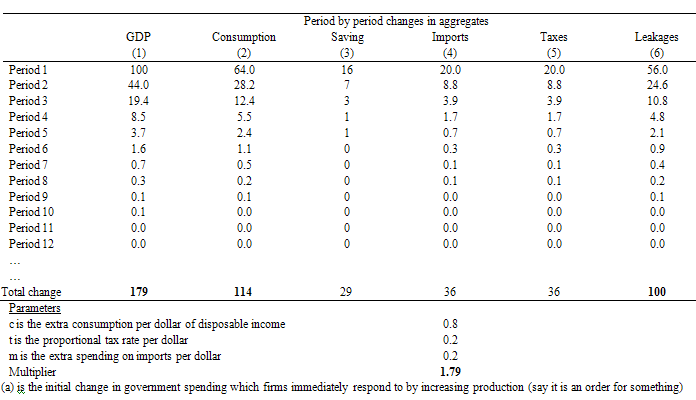 So the initial rise in government spending has induced new consumption spending of $64. The workers who earned that income spend it and the production system responds. But remember $20 was lost from the spending stream via imports so the second period spending increase is $44. Firms react and generate and extra $44 to meet the increase in aggregate demand. The total tax take is thus $36 after the multiplier process is exhausted. For those who are familiar with algebra, the total change in teax revenue is equal to 0.2*1.79*$X, which in English says equals the tax rate times the multiplied initial change in aggregate demand. So while the overall rise in nominal income is greater than the initial injection as a result of the multiplier that income increase produces leakages which sum to that exogenous spending impulse. At that point, the income expansion ceases.